All over the blog world, people are writing about cooking and baking with fresh, local, Spring produce. Here, the grass just turned green about 2 days ago. Fresh produce is still a few weeks away. The posts I’ve been reading from points south of here had me longing for fresh strawberries. The giant California strawberries we get all year here just weren’t going to cut it. Compared to a Quebec strawberry, the California ones are quite bland. I’m sure it has something to do with the shipping. How could a berry travel so far and still taste good? Instead of patiently waiting, I opened up my last jar of homemade strawberry jam and started to experiment. In the past I haven’t done much inventing, but I have to say this was a lot of fun. I actually put my face right up to the oven window as it baked; I was so excited to try it. 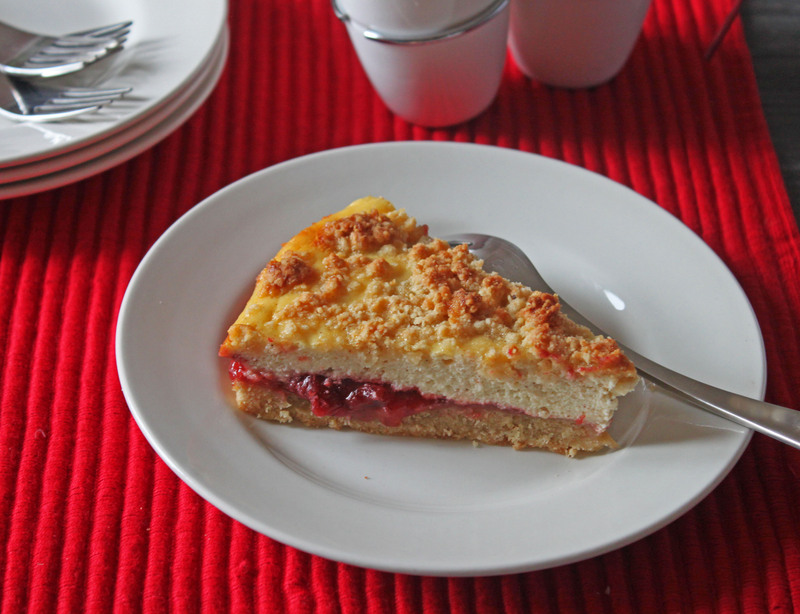 What I decided to make was a strawberry and ricotta tart with a streusel topping. I have to say it turned out pretty darn good. The jam added a great hit of strawberry flavour, the cheese layer was surprisingly light, and the almond meal in the crust added a really nice texture. Next time I might add a little cream cheese to the cheese to give it a little tang. Make the crust: In a large bowl, stir together the flour, baking powder, sugar, salt, and almond meal together. Using a pastry cutter or your fingers, cut/rub the butter into the flour until the mixture just holds together when squeezed and there are no large chunks of butter. Add the vanilla and the egg, stir with a wooden spoon until the mixture just comes together. Press half the dough into a greased 9 inch tart pan. Refrigerate for 30 minutes. Wrap the remaining dough in plastic wrap and refrigerate. Make the cheese filling. Place the ricotta, sugar, cinnamon, vanilla and eggs in large bowl. Stir until well combined. Once the dough crust has chilled, spread the jam over the crust. Top with the cheese mixture. Crumble the remaining dough over the cheese. Preheat an oven to 350 degrees F, bake for 40 minutes until golden. Allow to cool completely before slicing. This looks phenomenal, Lynn, I think your experimenting paid off. I know it must have been hard to open that last jar of jam, but strawberries will soon be in season in your neck of the woods (and mine!) and we can start afresh! Now thats what I’m talking about! I can already taste all the flavours! I may bring the tartness with some Raspberries instead, but chalk this one up as a must try! Yum! So pretty and delish! I’m always looking for new ricotta recipes. Great idea using strawberry jam for the filling! This looks delish! I just made a ton of fresh jam, will have to try it! Thanks! Looks so good!!! Thanks for sharing! This looks really good.. I love using fresh ingredients and who doesn’t love strawberries! Looks fabulous! I am also patiently waiting for local produce…sigh…I feel your impatience with spring and all things fresh. Way toget around it and turn out something fabulous, like this tart! I love everything about this tart … especially the almond meal in the crust! Looks so good!! Gonna try this one! The tart looks great. I love strawberry season. I’ve just baked one with cherries. Great recipe! I’ll post it on my blog. Thanx!